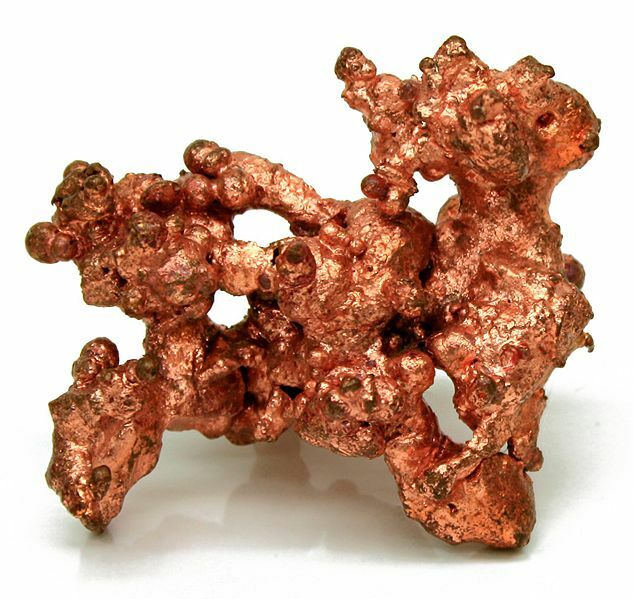 Copper has the chemical element symbol Cu and atomic number 29. Copper is a highly thermal and electrically conducive metal. 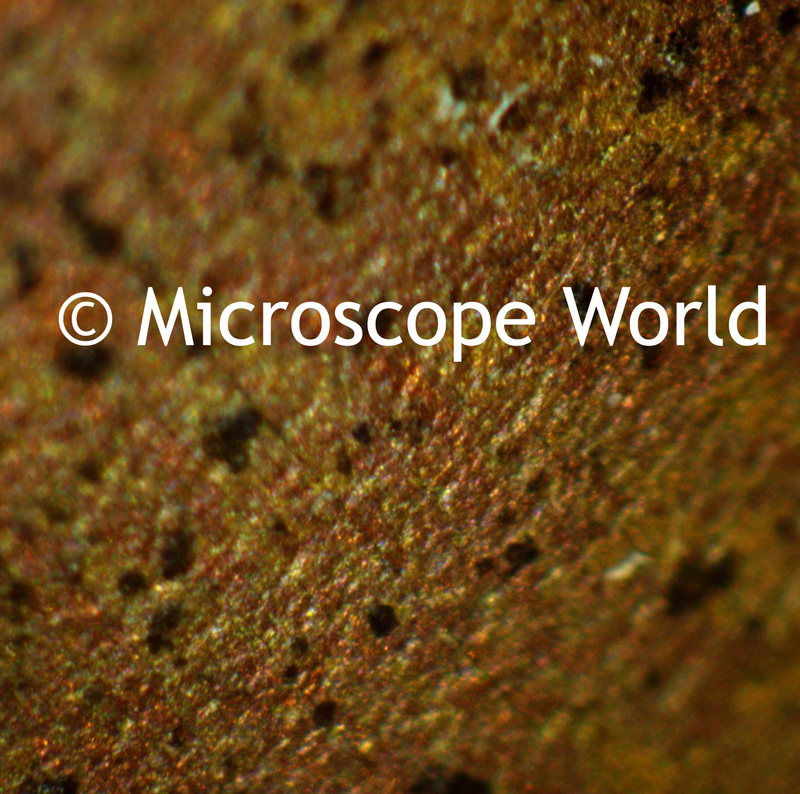 Pure copper is soft and quite malleable, usually with a reddish orange color. The major uses of copper are for electrical wires (60%), roofing and/or plumbing (20%), and industrial machinery (15%). Copper is primarily used as a metal, but when a higher hardness is required it is combined with other elements to make an alloy (about 5% of use) such as bronze or brass. Copper photo courtesy of Jonathan Zander. 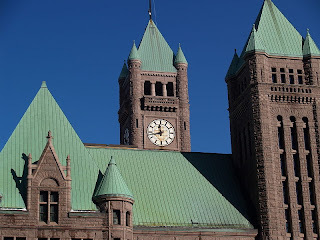 Because of copper's waterproof nature, it has been used as a roofing material for hundreds of years. The green color of these buildings, as shown in the image below, is due to a long-term chemical reaction. 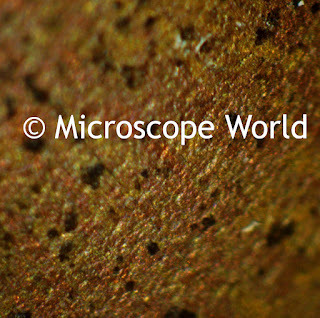 Copper is first oxidized to copper (II) oxide, then to cuprous and cupric sulfide and finally copper (II) carbonate, which is highly corrosion-resistant. Lightning rods use copper as a way to divert electric current through the ground rather than destroying the main structure. Photo courtesy of Micah Clemens. 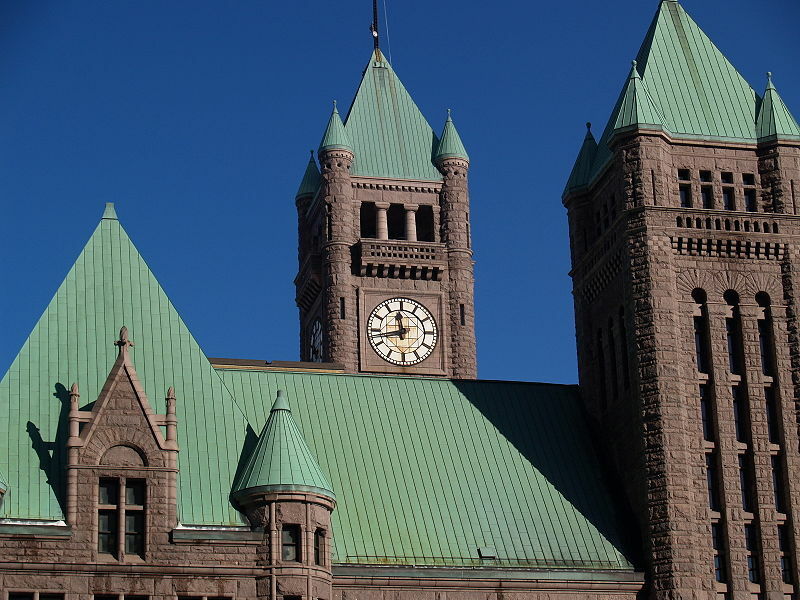 Minneapolis City Hall has a copper roof coated with patina. Copper is an essential trace element in plants and animals. The human body contains copper at a level of about 1.4 to 2.1mg per kg of body mass. Copper is absorbed in the intestines, then transported to the liver bound to Albumin. After processing in the liver, copper is distributed to other tissues in the body. Because of its role in facilitating iron uptake, copper deficiency can produce anemia-like symptoms in humans. 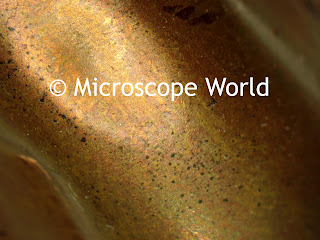 Copper pipe captured at 10x magnification under a stereo zoom microscope using the MW5.1 CCD microscope camera and software. 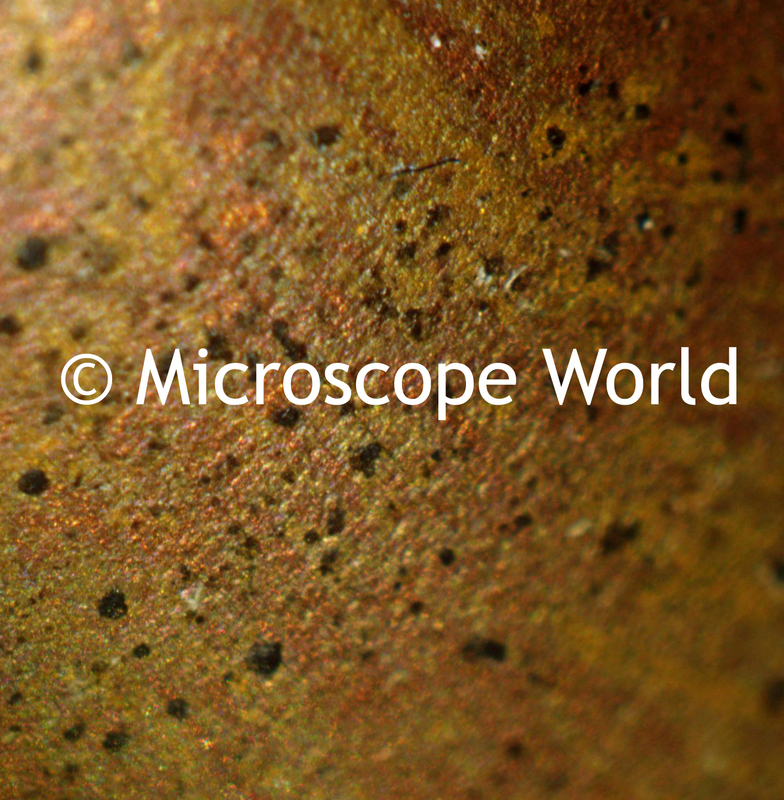 25x magnification under a stereo microscope. 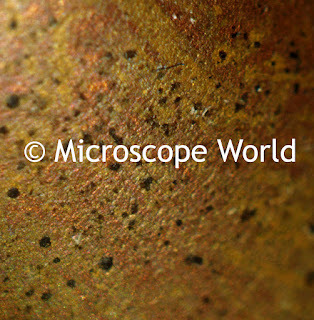 You will notice that the higher the magnification on the copper images captured above, the smaller the focused field of view. 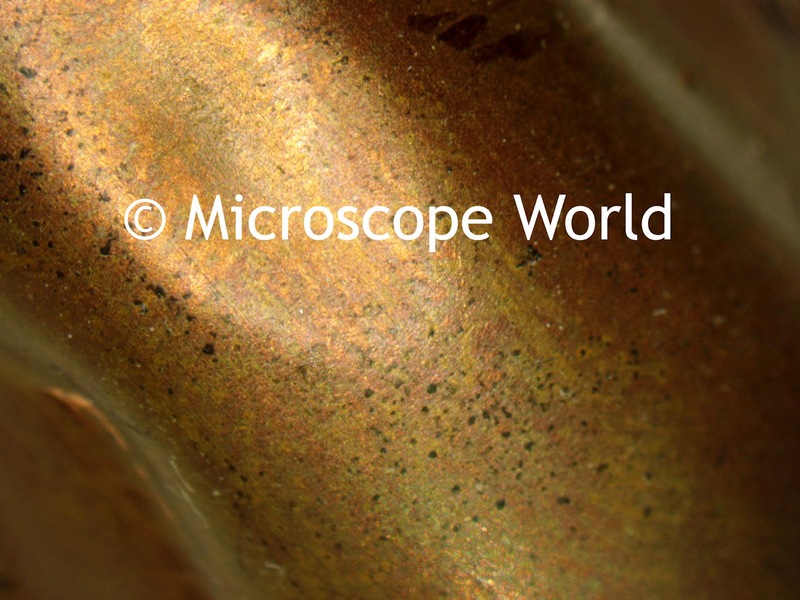 This is because the copper piece that was placed under the microscope was a curved piece of pipe, which provided less of a flat surface for focusing on. As magnification increases, the field of view decreases.